For all you die-hard gamers out there, this is the PC game chair that you’ve been looking for. This is the Best Game Chair HotSeat offers, it comes with the standard package of gaming console, controllers (pedals, flight sim controller, throttle) and a custom built high performance mini PC. At your command with a single click of the mouse, you can go online and chat with your friends while racing. The video quality is superb, and it comes with a NVIDIA video card, combined with 23″ WideScreen HDTV LCD. 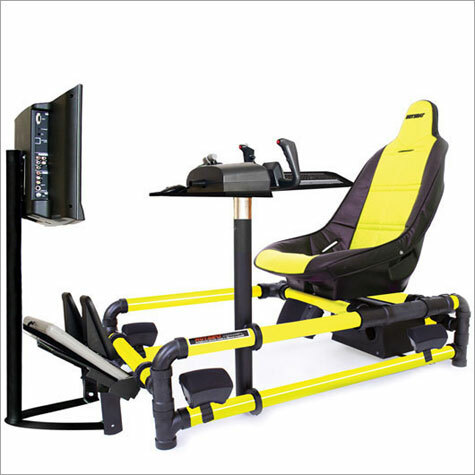 The computer is so compact, that after you’re done playing, you can fold the chair, disconnect the PC from the racing seat, and carry it over to your desk to use it as a desktop. Carries a 1-year warranty.